There are a few ways you can loop through files in a folder. You can do it only for a chosen folder without entering the folders inside it, or you can do it recursively and then save them to a text file. I created a few examples, where you can see different examples and choose the one you need. This is the treeview of directories and files. This example is the most simple one. 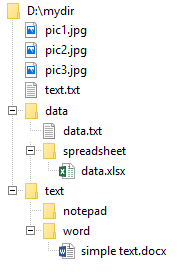 It will list all files and folders that are located in the chosen directory. This code will return the list of files in D:\mydir\. If you want to list also directories, you have to add an additional parameter to the Dir function, namely vbDirectory. Now, the code will return the following list. If Right(folderPath, 1) <> "\" Then folderPath = folderPath & "\"